Sometimes I come across a book that reads like a movie. One that would be perfect for the big screen. Each scene and character is presented in such a way I can see it in my mind's eye. Marcus Sakey's The Two Death's of Daniel Hayes is one such book. The car chase, the action sequences, the angst and sense of betrayal. The doubt and frustration. And what's more, the characters are movie perfect. I was reminded most of Momento and No Country for Old Men as I read The Two Deaths of Daniel Hayes. A man wakes up on a beach, shivering from the wet and cold. He has no memory of who he is. He discovers a car with the name Daniel Hayes on the registration, which he assumes is him. He does the only thing he can think of to do, he follows the leads in front of him, hoping to regain his identity and past. He isn't sure he likes what he discovers: a dead wife that he may or may not have killed; a man searching for him and threatening his friends; the police, hot on his trail; and the public who has already convicted him. 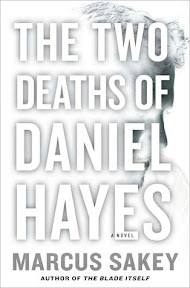 The Two Deaths of Daniel Hayes is one of those edge of your seat type books. It takes off at a run and doesn't let up until near the end. I confess I wasn't too sure about Daniel at first. And I couldn't help but ask myself what I would do in his shoes. I am not sure I would have immediately gone into flight mode the way he did--but then, I doubt I would find a gun in my glove compartment. The twists and turns weren't too difficult to see coming in all honesty. I really can't say too much more without giving something away I shouldn't. I should point out that this particular book was on the Independent Literary Awards, short list in the Mystery category. As a result, I went into it with high expectations and a more critical eye than I usually do with the books I read. I mean, this was an award contender, right? I can see why it made the short list. The writing was good (although I wasn't a big fan of the screenplay narrative bits), the characters fully formed, and the story well told. It didn't quite hold that wow factor for me, but it was a good ride while I was reading. It certainly kept me flipping pages as fast as I could to reach the end. And I definitely would catch it in the theater if it made it to the big screen. You can learn more about Marcus Sakey and his books on the author's website. Source: Copy of the book provided by the publisher for review. I like that there was so much action and suspense in this book and that it played across the page with vigor and quickness. I can't say that this is my usual genre, but it might be something worth trying when I am looking for a book that is fast paced and easy to escape into. Great review today! Heather - I really liked that about this book too. I was on a deadline to read this and the other four short listed books and I was so worried I wouldn't be able to fit them in. It helped that the book was so fast paced. I love books like this from time to time - they are such a great distraction from life. Kathy - I agree. And it really was a great distraction. I love immersing myself in books like this on occasion. While this one didn't completely wow you I am adding it to my list. The premise is really intriguing and I just recently rewatched Momento so I am in the mood for something like this. Adding this to my wish list. I love fast paced mysteries. I feel like I need that more now because otherwise I would skip reading altogether! I thoroughly enjoyed the suspense in this book! Glad you liked it, too. I've had this one on my radar for some time now. It sounds really good so I'm definitely going to have to read it at some point.